Meet James Weidner. A very grateful human being today. He is moving into his apartment in which you furnished. Many thanks to you as I told him and the many others that were on hand for his move in this morning that we were thankful to be able to provide for the needs of another. I described to him that you all contributed and took pleasure in the contagious nature of giving. James described himself emotionally as "the face of homelessness." James is a 53 year former professional, formerly from Michigan, who was married and making over $200,000 a year. He has 3 children going to local schools. He went on to say that he suffered from severe depression and lost everything. He came into Samaritan in April of this year weighing 285 lbs and has since lost 75 and regained employment making $33,000 a year and is most happy. We also learned that he is 9 credits away from finishing his bachelor's degree at Collin College. It was an emotional experience today to realize the impact we all can have on any given situation. Where we felt like we didn't give much, it was weighed heavily by the recipient of this generosity that you chose to involve yourself in. Maria Marcela and I would like to thank you for making it happen. As God's spirit continues to move us to look outward and to the needs of others, I believe we can further catch a more clear glimpse of His nature and love for all of us. It only makes sense that He wants that nature written on our own hearts. We'd like to say thank you to all of you who contributed to the furnishing of the apartment this year. 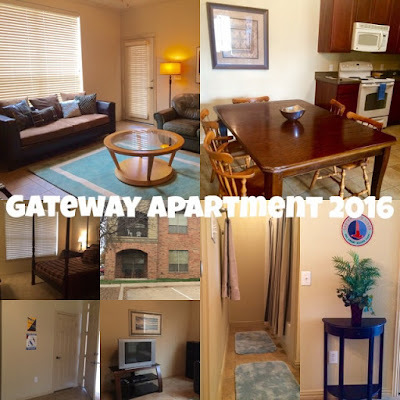 Below is a collage of photos that Andrew put together of the apartment in McKinney. The resident will be moving in this coming Friday. Click on the image below to see the entire collage.